A deity is a postulated preternatural or supernatural immortal being, who may be thought of as holy, divine, or sacred, held in high regard, and respected by believers, often religiously referred to as a god. Deities are depicted in a variety of forms, but are also frequently expressed as having human or animal form. Some faiths and traditions consider it blasphemous to imagine or depict the deity as having any concrete form. They are usually immortal, and are commonly assumed to have personalities and to possess consciousness, intellects, desires, and emotions similar to those of humans. Such natural phenomena as lightning, floods, storms, other 'acts of God', and miracles are attributed to them, and they may be thought to be the authorities or controllers of various aspects of human life (such as birth or the afterlife). Some deities are asserted to be the directors of time and fate itself, to be the givers of human law and morality, to be the ultimate judges of human worth and behavior, and to be the designers and creators of the Earth or the universe. 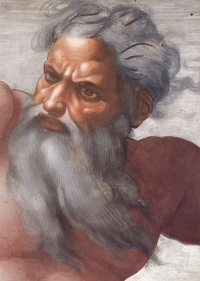 Notable deities include Tsui Goab, Mangar-kunjer-kunja, Shiva, Yuanshi Tianzun, Ra, Zeus, Anu, Ahura Mazda, Vesta, Odin, Yahweh, Quetzalcoatl, Ika Omkara, Dirawong, Mars, Exu, Jesus, among others. Unless indicated otherwise, the text in this article is either based on Wikipedia article "Deity" or another language Wikipedia page thereof used under the terms of the GNU Free Documentation License; or on original research by Jahsonic and friends. See Art and Popular Culture's copyright notice. This page was last modified 14:38, 19 April 2013.